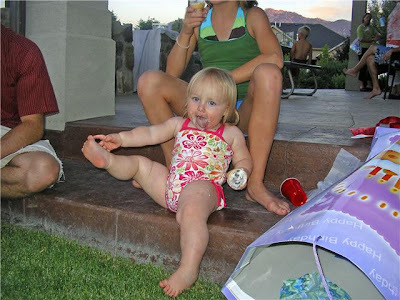 The Nelson Family Smorgasbord: Baby's Got BACK! Some SERIOUS Junk in the Trunk!! So here is our little Chub 'o' Burnin' Love! Just today someone that doesn't even know us very well said, "Man, she is a TANK!" All I can say to that is, "Yeah! Isn't she awesome?!" I think I cash in a million smooches all over her chubby cheeks and "sweet rolls" every day!! I love it, love it, love it! Just chillin' at Uncle Derek and Aunt Jillsie's! She had a blast in their pool! I never knew diapers could explode...until today! 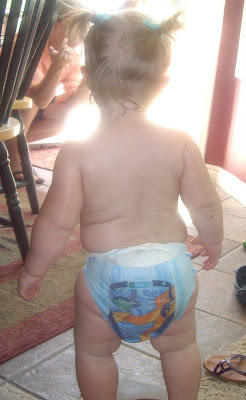 Charly's bum looked like Driselda's dress in Cinderella when we put a swim diaper over her regular diaper for the Ashby's summer splash party...not the best idea!!! 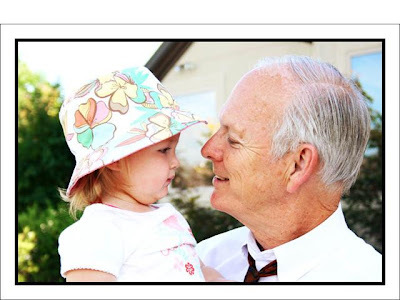 One thing's for sure, this little girl LOVES her "Opa"!! ....Thanks for the title, Pulsie and Babo!...and the pics! How fun! Grace has the sweet roll thing going on too and I wouldn't have it any other way either. She is adorable! I love that diaper picture! And that photo of Charly with your Dad is precious! Frame worthy for sure!! Hey Kristin! It's Melanie (Messick) Miller and I just wanted to say hi! 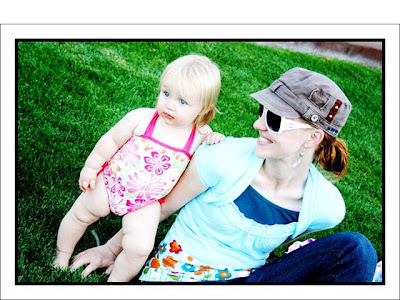 I saw your blog from facebook and I just love how cute your family is! And I especially loved your response when someone called your child a tank. You are so cute! If you send me your email address, I'll send you an invite to my blog...melbelmiller at gmail.com. (or maybe it's the same email you use on facebook?) Anyway, I love catching up! So I have seen that picture of Charly's junk in the trunk several times, but it looks so better on your cute blog! I love the diaper and piggy tails shot! So adorable!! And I love that she is so smooshy! All the more Charly to love on!! Kristin, thanks for the comment on our blog. Charly is way too cute-I love love love chubby babies! Molly's got a little bit of Goodrich (they're all so skinny) in her and has never chunked out as much as I did as a baby. Don't you love being a mom to a little girl? I know I do! I love Charly's chub! What a doll with those sweet pigtails! Baby girls are so much fun...Whitney's already got a chubby bum, hips, and thighs that Taylor never did! Kristin I just love Charlys rolls! I can't believe someone said that but you are so awesome and responded so well! We need to get together and have a little play date with Jenna! ha ha ha, I love chunky babies!!! They are the best!